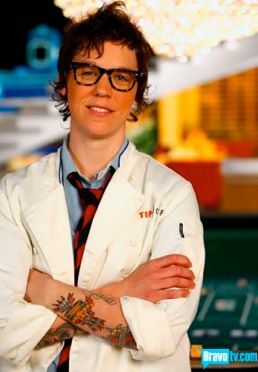 If you’ve been following Seattle’s contenders on “Top Chef” this season, you likely know Ashley Merriman, chef-exec at Belltown’s Branzino, has been eliminated. Last week, she severed ties with Branzino — ties that have been tenuous over the past months. “I left Seattle in August,” said the chef, now living in NYC where she’s finishing her commitments to “Top Chef” (which includes filming a reunion show) and lending her friend Alexandra Guarnaschelli and the owners of Butter a hand as they prepare to open a second restaurant in Charlotte, NC (perhaps you’ve seen Alex’s TV appearances on her new Food Network show, “Alex’s Day Off”). Merriman worked for Guarnaschelli at Butter for two-plus years before moving to Seattle in 2005, and will be working there again full-time come January. Here, she cooked alongside Maria Hines at Earth & Ocean, and later with their friend Dana Tough (of Spur and Tavern Law) at Hine’s Wallingford restaurant, Tilth. Prior to taking the reins at Branzino, she was Tamara Murphy’s sous at Brasa. Balancing her gig as executive chef at Branzino with her role as a “Top Chef” contender has been difficult, Merriman explains. “I gave notice in June, but of course, with the show coming out they wanted to capitalize on that, on the free publicity. I agreed to come back and forth [from the East Coast] for the duration of the show, to continue to be their executive chef, have my name on the menu and oversee the food with my sous acting as chef de cuisine in my absence.” Merriman also agreed to come back and preside over special-event dinners, including one slated for next month, but on Tuesday said, “I’ve decided that it is in my best interest — professionally, and personally — to end my relationship with Branzino right away. Her former boss, Peter Lamb, agrees with that assessment and said he’s pleased to have Stewart’s signature on Branzino’s Italian menu.